The Sinfonietta for eight tenors and one bass trombone, is an engaging work presented in three contrasting movements. The first movement begins with soft, subtle Andante material, then grows and shifts to a lively Vivace marcato section. The second movement, Andante e poco rubato, is a lyrical song that features the third trombone in two brief solo sections. The final movement, Allegro molto vivo, is a “diabolical virtual musical race on haunting themes” that includes energetic material and is sure to stay exciting until the end. The musical tools used in the individual parts, such as time signatures, key signatures, rhythms, and technical material, do not present notable difficulty, and are well suited to an average college trombone choir. The bulk of the difficulty lies in the ensemble language, which requires musical independence from all players. The first part demands an exceptional upper register, as its tessitura lies predominantly between d and f2. Although the composer indicates this part to be played on tenor, it may lie more comfortably on alto. The first three parts are in tenor clef. 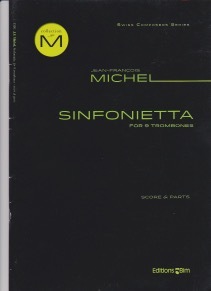 The score and parts are printed on high-quality paper and are extremely easy to read. This piece was written for the Swiss trombone ensemble Lucerne Bone Connection, in a commission made possible by Ursula Jones-Strebi, in memory of her husband, Philip Jones (1928-2000).